Ewwwwwwwwwwwwww! You keep the smell over there, okay? This card is scary cute! This card is super awesome!!!! Anita I absolutely love it!!! I love, love, love this card (and not really a Halloween fan)!!! Fantastic job! That card is gorgeous and you don't need any more practise. This card is amazing! I love the spider web! It turned out pretty cool I think... My glimmer mist has an odor too, so maybe it is just them! Beautiful Halloween card! It's never too early for holiday cards-it gets me in the spirit! Cute card-and good luck with your stamp company! (I read your profile.) Keep us posted! Wow - what an awesome card! LOVE it! This is a fun fun card! I do not have these stamps--another must have! TFS! very cute, anita! happy weekend! Oh, this is soooo much fun! You definitely got the Tim Holz-y thing right... the whole thing just rocks! So glad to see I am not the only one to be breaking out the Halloween stamps and stuff. Still can't bring myself to get the Christmas ones out tho :-) Great card love that EB Folder! Super cute! Love the EF! OMG, that is a fabulous Halloween card! Loving it! LOVE your card--I think it looks great. Not too sure what you wanted it to look like, but i think it is great. Fun Halloween card! Love the colors and the sparkle. Super cute!! 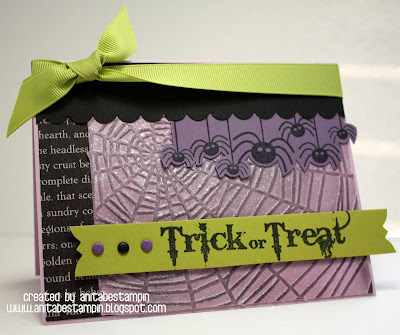 I love making haloween cards & paper crafts! !